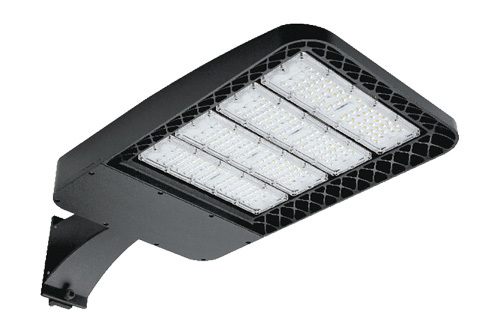 LED Shoebox/Area Light series can be used in parking lot, urban roads, industrial areas, residential areas, sidewalks, schools, and gardens. Wide detection area, range up to 52FT in diameter. - American design style, high quality aluminum die casting, painting process (DUPONT coating powder), and cracking prevention. - A mini copper core seal is put on the heat sink, allowing it to breath and improve heat dissipation. This will automatically adjust the inside and outside pressure to ensure no vapor will appear. - Front surface with inner-depressed design with anti-glare fuction which prevents the lens from turning yellow after long run under sunshine. - All parts are joint together by a corrosion-prooft silicone ring to fulfill the waterproof of IP rating. - Stainless steel screws with strong anti-acid and anti-alkali to prevent corrosion. - Square Pole Mount Arm. - Round Pole Mount Arm. - 1-10V dimming is standard. - Provided with integrated surge protection of 12kV for 100-200W, and 10kV for 300W.